Whenever Microsoft announces a new version of Windows operating system, Windows enthusiasts start developing transformation packs with aim to make previous Windows versions look and feel like the latest version of Windows. Now that Microsoft has announced and released preview builds of its upcoming Windows 10, developers and enthusiasts have begun releasing Windows 10 transformation packs for its predecessors – Windows 8 and Windows 7. As with the case of other transformation packs out there, Windows 10 Transformation Pack for Windows 7 and Windows 8 is designed to make your Windows 7/8 look like Windows 10 in a few mouse clicks. The Windows 10 Transformation Pack for Windows 7/8 includes resources extracted from Windows 10 system files. The UXStyle tool, which is required to enable third-party support, is also bundled with the transformation pack, meaning you don’t need to manually download and install UXStyle. NOTE 1: Start Menu Reviver, which included in Windows 10 Transformation Pack, doesn’t look similar to the Start of Windows 10. If you wish to get the new Start on Windows 7/8, please go through our Windows 10 Start menu for Windows 7/8 for detailed instructions. NOTE 2: To get Windows 10 like taskbar search box, please go through our how to get Windows 10 style taskbar search box in Windows 7/8 guide. This transformation pack also comes with Desktops software from Microsoft to add Windows 10-style virtual desktop feature in its predecessors. You can deselect feature that you are not interested in while installing the transformation pack. As always, we recommend you create a manual system restore point before attempting to install any transformation pack so that you can quickly restore Windows to its default settings if in case you want to get rid of the installed transformation pack in future. If you’re on Windows 7 or Windows 8, we suggest you update your existing Windows 7 or Windows 8 installation to available Windows 10 Preview build. You can later upgrade the Preview build to the RTM when released. As you likely know, Microsoft has announced that Windows 10 would be a free upgrade to existing Windows 7 and Windows 8 users who upgrade within the first year of the release. So there is no point in installing transformation or skin packs when it’s possible to upgrade to newest version for free. Warning: With the default settings, the installer of Windows 10 Transformation Pack sets Windows X’s Live as default homepage. You might want to uncheck that option while installing the transformation pack. 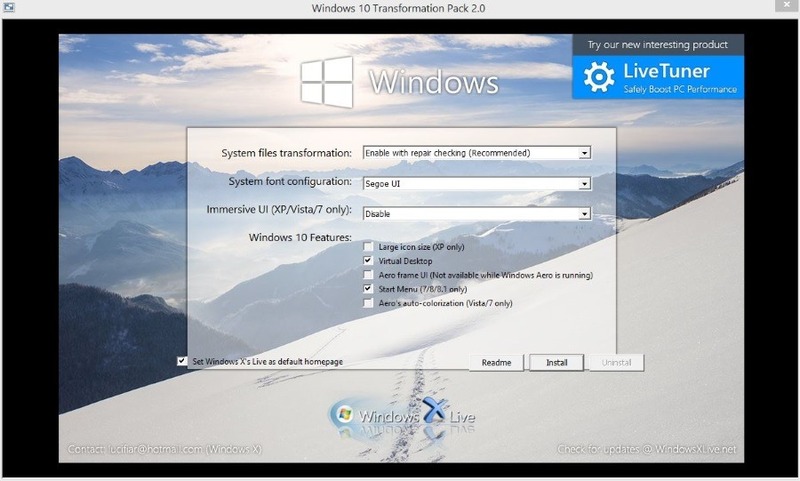 The transformation pack is compatible with both x86 and x64 versions of Windows 7/8. Be sure to download the latest version of Windows 10 transformation pack as it includes new icons and wallpapers. I regret switching to Windows 7 from Windows 10, lol. I just love the UI of the Windows 10. Thanks for the transformation pack, at least, being able to get a feel of the Windows 10 UI. Thanks, but the Win10 look is too fugly for me.